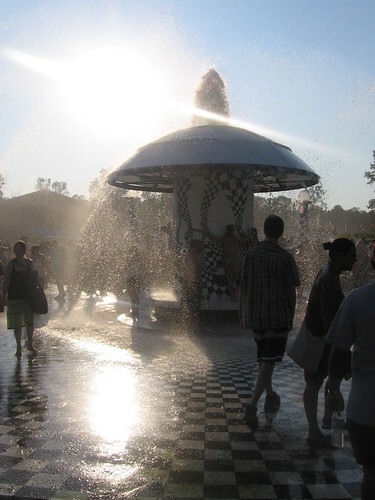 Bonnaroo 2008 Is Here! Are You Ready, Bonnaroo? Hey everyone — it’s finally here!!! The excitement of Bonnaroo 2008 has arrived and everyone is buzzing madly, ready to spend four days together camping at one of the largest and most beloved music and arts festivals in the U.S. Bonnaroo brings 100,000 people annually to Tennessee, bringing in millions of dollars in revenue to the state and, not unsurprisingly, bringing together people from a wide swath of social groups. The potential change in social dynamics of the festival has been criticized by long-time fans of this year, in part due to the inclusion of Metallica as headliners. The main reason: Metallica has, in recent years, been more widely recognized by young fans for their off-stage activities, like suing file sharers and trying to control their presence on the internet by going after music bloggers — activities which have not warmed them to a generation whose internet activity has increased daily since well after Metallica released their last culturally relevant album. Given the disillusionment of Bonnaroo’s stronghold of steady fans, advance general admission sales have dropped slightly this year. However, V.I.P tickets for this event have been sold out since last week. As in years past, the festival’s many strong smaller acts — including MGMT, Tegan & Sara, MSTRKRFT, Broken Social Scene, and M.I.A. — are expected to draw thousands more regular fans from around the area over the weekend. Mainstage performances from Chris Rock, blues legend B.B. King and the recently-announced late night performance from kanYe West will likely bring the festival to an expected sold-out crowd. Nathan and I are looking forward to seeing you all out and about at the festival. Be sure and check Idolator for our festival updates, interviews and video footage. Manchester, HERE WE COME!! « Older: Nas’s Controversial New Video For Controversial New Song “Be A N*gger Too” Premieres. » Newer: VIDEO: A Fat Boys Dedication To Coolio, Warren G, Chamillionaire and Any Other Rappers Being Oppressed By “The Man”.